Or, so the song goes anyway. 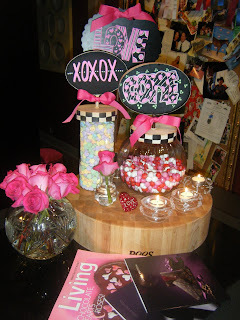 Some of my current favorite fun Valentine things are pink roses, the jars with the chalk board tops and chalkboard stand (you can change out the ribbon and write on them with chalk markers (all from The Paper Daisy in Cypress). The large jar with peanut M&M's takes about seven bags to complete fill up, and looks adorable when it is. And M&M's come in every color for every occasion, so you name it and you can find the color your looking for. 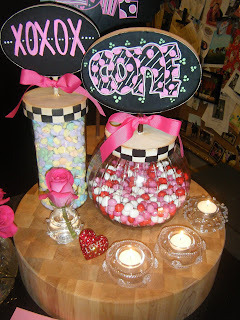 The tall jar has conservation hearts in it, now we all know conversation hearts are a Valentine's Day staple, tradition, must have, whatever spin you want to put on it, conservation heart are Valentine's Day, but NO ONE eats them. We do however read them: puppy love, xxoo, true love, hugs, all mine. I would like to see the following on conservation hearts: spend freely, I took the trash out, don't cook, did you lose weight. I could go on and on. The pink rose in Juliska Bud Vase and Juliska tea lights are both available at either Neiman Marcus or Saks Fifth Avenue. The bud vase come in a set of three and the tea lights are sold as individuals. Living Magazine, 2010 Valentine's Day Louis Vuitton gift selection for him and her, now the her selections are amazing and would make any woman HAPPY. I really really really would be happy with the bangle bracelet. I'm just saying. But the him selections are, well...there not, for her. I'll leave it at that. The last item in the photo - The big tacky LOVE red diamond encrusted ring, what could I possibly say, but I don't know what I was thinking. Oh, I remember, I was thinking I would wear it to cards with the girls in February for the fun of it and obviously the embarrassment of it. Mission accomplished.